The real deal. It is a hint of turmeric that does the trick, says Nataraj. The security guards at the Mysore Palace don’t have it easy, especially on a Sunday at closing time when their only task is to drive out droves of tourists (50,000 on weekends and holidays – yes, it is up there with the Taj Mahal in terms of visitors). My path out of the palace is slightly easier – as part of a unique insider tour put together by the Grand Mercure Mysuru (the city’s newest luxury hotel), through what used to be the royal kitchen. “4000 people would eat here every day,” says the palace official. This block now houses the administrative offices of the palace. I’ve heard some tales about the royal cuisine from Mysuru but sadly that’s all that is left of it – legends. Kakasura Madappa is one of those legends you will hear about in Mysuru. Madappa, who cooked for the kings of Mysore, is credited with inventing the Mysore Pak about a century ago. 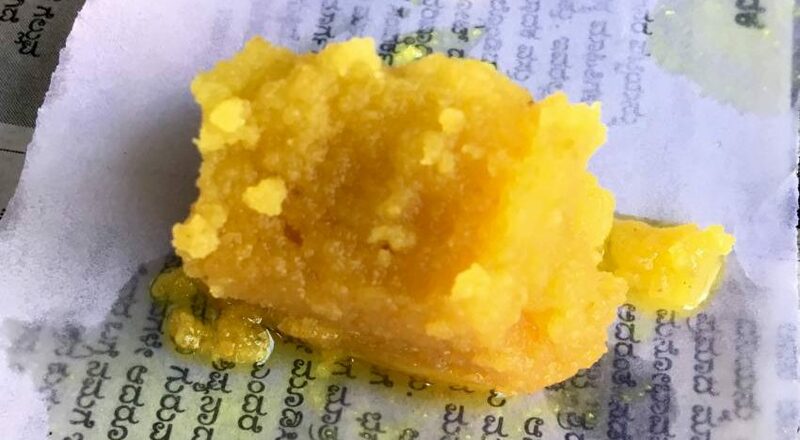 There are some who dispute this theory, suggesting that this sweet has its roots in Ramnagara – on the Bengaluru-Mysuru highway where Sholay was filmed in the 1970s, and then there’s Janardhana Hotel (locals call it the Mysore Pak Hotel) that has been a popular pit-stop for travellers on this busy road. But try suggesting that to the small crowd that’s gathered outside Guru Sweets in the busy Sayaji Road Market Area, and you might end up starting a riot. The anticipation on their faces for the fresh supply of Mysore Pak almost reminded me of my childhood in Bengaluru when I would wait with bated breath outside my grandmother’s kitchen for piping hot Mysore Pak. Just three ingredients – chickpea flour, sugar and ghee (in a 1:2:3 ratio) — come together to create an iconic sweet that is slightly hard on the outside and yet crumbles when you pop it into your mouth. Paka is the local name for sugar syrup; hence the name Mysore Pak. I still remember binge eating this sweet when it was fresh off the pan (a microwave somewhat fixes that for me now). Nataraj, Kakasura Madappa’s great grandson, runs Guru Sweets in Mysore. Nataraj offers me the first go at a fresh batch of Mysore Pak. He is Kakasura Madappa’s great grandson, and runs Guru Sweets along with his two brothers (Kumar and Sivanand). It’s pokey – there’s room for just him and one staffer (the brothers take turns and manage the store in shifts). The entire family (some 30 of them) live under one roof just down the road from the store; and the Mysore Pak is still made in their home kitchen – which is why it was still hot when I sampled it. There was no tissue in the store to wipe all that ghee from my fingers, though. Not a lot has changed since the store moved decades ago from its original location on nearby Ashoka road to the busiest part of town. 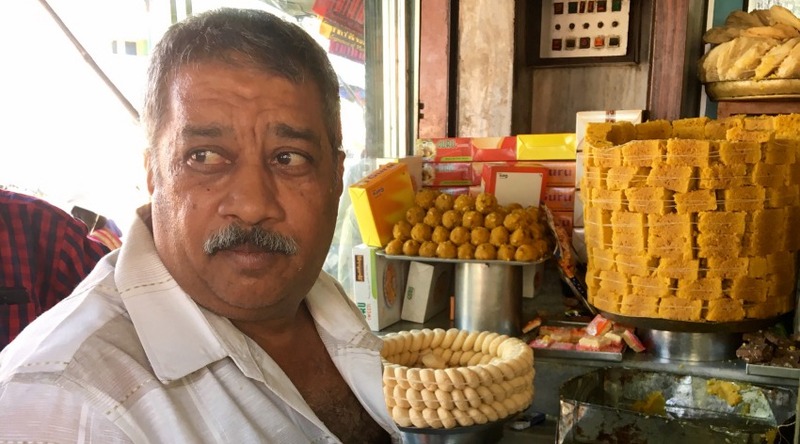 “We wanted to make it easier for locals to buy the sweet,” says Nataraj nonchalantly. There are other popular establishments in Mysore, such as Mahalakshmi Sweets, that might even sell larger quantities of Mysore Pak. And in Chennai, the softer ‘Mysurpa’ sold at Shree Krishna Sweets and the slightly crumblier version at Grand Sweets have their respective fans. Guru Sweets’ Mysore Pak isn’t cloyingly sweet. I ask Nataraj if it is turmeric — just a pinch — that does the trick. He smiles and concurs. “We do make other sweets but almost every customer orders the Mysore Pak first,” says Nataraj. Guru Sweets also makes a Vanaspati version that doesn’t quite melt in your mouth, and neither does it have the crumbly texture of the original. I meet a postal department employee from Kumta, in North Karnataka, who has been waiting for half hour for the tiny three-wheeler that does the short run from the kitchen to the store. He has strict instructions not to return home without the Mysore Pak from Guru Sweets. That’s the point at which I ask Nataraj why the family has chosen not to expand beyond this one ‘hole in the wall’ establishment. “We are content,” he says. That response from Nataraj shuts me up for the evening. I leave Guru Sweets with the hope that the next generation in Kakasura Madappa’s family will take on the reins and maintain the same passion to preserve the family secret. It’s probably the last link the city has with its royal kitchen, and it would be a shame to see it snap.